I have been using the Fortifeye Super Protein, the vanilla flavor, and the Fortifeye Blue Green Superfood for a official 2 weeks now, and I have lost 6 pounds. I was a little skeptic when I started, but my dad encouraged me to give it a try, and he was such a supporter of you, that I took his word for it. It was a great decision. Your products have helped me to establish a better eating habit and how to portion control. Before I was eating late and I would have extremely high calorie foods at night. Now, I do not eat past 6pm and I am only having the shake. I find that the shake fills me up and I am not desiring any additional food. I have to admit, I did miss a few nights of the shake due to not being hungry mostly and I still lost the 6lbs. Being a mom of 2 little ones, this helps a lot because I am still losing the weight without having to do extreme workouts which is what I was doing before. I try to workout at least 3 times a week. However, even if I do not meet that goal, I know I will still lose the weight. Thanks for 2 great products. I will keep you updated on my continued success. Thanks again and have a great weekend! I’m writing to describe by positive results with your products, most specifically Super Protein. I’m a 66 year old male who has dealt with heart palpitations for 20-30 years. Each family physician I talked with said it was stress or lack of sleep. I grew to just accept it. About six months ago, Dr Lange suggested I try the Super Protein to promote overall health. After a month, I began to notice a marked change in the occurrence of palpitations. I mentioned this to Dr Lange. He immediately said four things can cause palpitations. As my family physicians had said, stress, sleep and dehydration , however, Dr. Lange also said a lack of Glutathione can cause the problem. Super Protein contains the Glutathione. My palpitations have decrease immeasurably. I owe it to Dr. Lange and his products. I trust Dr. Lange for my eyes and my nutritional needs. Dear Dr. Lange, my husband and I have been using your Fortifeye Vanilla Protein Shake nearly every morning. Usually I mix with water and perhaps some fruit. No only is it delicious, but we both are comfortably full until lunch time. Since mornings are a rushed time for us, it has been a wonderful way to start our day. We also have greatly benefited from Fortifeye vitamins. Keep up the good work! At 63 years old, I am aware that people in my generation and older do not get enough protein in their diet. I am a long distance runner having ran 2 Boston Marathons, 1 Chicago Marathon, 1 Paris France Marathon, and 2 Des Moines Marathons all after turning 55 years old. 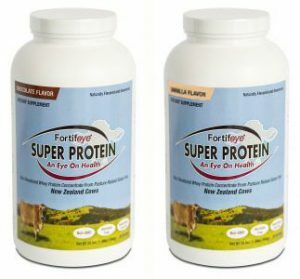 I have switched from using GNC protein powder to using Fortifeye Super Protein daily. It mixes much better with liquids and I mix it with vanilla coconut milk or add it to my fruit and veggie smoothies. I prefer the vanilla flavor and it tastes good to me. I like the health benefits and the science behind this product that Dr. Lange has developed. I am optometrist and a board certified nutrition specialist. Proper nutrition and exercise is very important to me as, in my family history, obesity and heart disease has been very common. Starting using Fortifeye Super Protein Chocolate Flavor and Fortifeye Complete Macular Defense. Tried the pre-work out recipe given on the site. I would recommend making it with CALIFIA FARMS Vanilla Almond milk. This recipe is so delicious! Could not believe how good it tastes! I have it for breakfast and then wait 1/2 hour to work out. Interestly enough I am not hungry till lunchtime because it makes such a large smoothie. Very filling. Thank you Dr. Lange for mentioning it to me! At the age of 72, I am more physically active than ever. I work out in the gym every other day because it is essential that I maximize and maintain my health. And yes, I am also interested in enhancing my physique. On those days that I am not at the gym, I can be found of the golf course or the practice range. Since adding Fortifeye Super Protein to my dietary regime, I have noticed enhanced performance and my sore muscles seem to repair more quickly. My wife and I use the Vanilla Fortifeye Super Protein in our morning smoothies. It really tastes great and digests well. I usually don’t do well with most protein supplements, but I haven’t had any trouble with bloating, gas or digestion problems. When I don’t have time for a smoothie, I just mix a scoop with almond milk–awesome! That will usually hold me over until noon. I find that the protein mixes well, is very smooth, and is not chalky. I guess that the protein source, A2 New Zealand cows, really does make a difference! As a very active 60 years old, I’m very happy to have found such a wonderful protein source. I wanted to thank you for sharing the Fortifeye Super Protein with me! I enjoyed the most delicious shake this morning, I mixed with only a cup of mixed berries and unsweetened almond milk … very good, very impressed!! I am going to get my 16 yr. old son to try, I am pretty sure it will be a hit with him as well. I loved the Fortifeye Super Protein vanilla drink. Oh, my it is addictive! It tastes sooooo good and mixes perfectly with fruit. It gave incredible energy and not like the pea protein drinks! The body energy was amazing….solid, constant and filled the body with strength. For older people this will be great as it will jump start them to want to exercise…you feel free and revived and want to move after drinking Fortify Super Protein. My Dad who is 92 years old tried it and said he had more energy and could move better! Thank you so much for sharing the info with me and creating this product. It was wonderful to read about the source of the whey from New Zealand A2 cows. Wow, thank you this is such a healthy product! !